Pedicab advertising follows your audience unlike other forms of outdoor advertising such as telephone kiosks or bus shelters. Because of the novelty and utility of pedicabs, an outdoor advertising campaign involving pedicabs provides recognition, exposure and recall of the brand identity. And unlike other forms of outdoor advertising, there is of course the pedicab driver, putting a personal touch on the trip. That's why we call it performance media. Click here to see some of our recent campaigns. 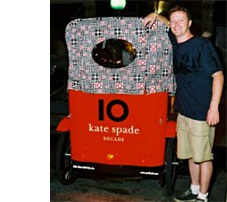 Manhattan Rickshaw Company is an industry leader in pedicab advertising with a proven track record. Recent clients include: Axe bodyspray, Target, Red Bicyclette wine, the New Yorker magazine, Eddie Bauer, Kate Spade, Microsoft and Altoids. We work with clients to maximize the creative potential of these vehicles and to reach an hourly impression rate of thousands of viewers. So if it's an illuminated lightbox carried on the back of the cab, a canopy featuring custom logo printing, or color-matched vinyl wrapping applied to the entire cab body, we love to be challenged. Pricing: Rates are quoted for monthly, weekly, daily, seasonal and off-season campaigns, or otherwise custom-tailored to your program. Please call (212) 604-4729 for more information or contact us via email. Media Life interviewed Manhattan Rickshaw's entrepreneur, Peter Meitzler, for an informative article about advertising on pedicabs. Emotional Branding: The New Paradigm for Connecting Brands to People discusses new marketing techniques, including the use of rickshaws as an advertising medium. It also contains photos of our vehicles! Amazon.com says it's "a visionary approach to building powerful brand loyalty, this groundbreaking book shows marketers of any product or service how to engage today's increasingly cynical consumers on deeper emotional levels." See Manhattan Rickshaw on The Apprentice. 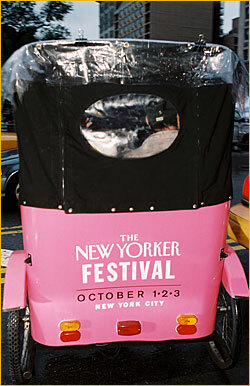 Canopy Ads use fabric printing to incorporate your brand message into a very functional part of the pedicab -- the canopy. It often serves as a colorful accent on the pedicab body, which is often wrapped in a complementary color scheme. Click to see. Wrap Ads cover the sides and rear and sometimes the entire cab body with a tightly fitted vinyl wrapping, color-matched to your specific color. Then we apply up to four-color die cut vinyl lettering on top of the wrapping. This type of ad creates a significant presence on the street, a rolling billboard, a kinetic sculpture carrying your brand or logo. In addition, the vinyl wrap is very sturdy and stands up to rain, sun and wear and tear. Click to see. Lightbox Ads are carried on the rear of the cabs. While dimensions of the light box may vary, in general they are approximately 20 inches tall by 30 inches wide, powered by a 12 volt dc battery source carried on board the cab. Artwork is sandwiched between two plexiglass panels. Lightbox ads usually are custom-designed to your specifications. Click to see. Panel Ads are frequently vinyl panels with adhesive that we apply to the sides and rear of the pedicabs. We also can mount thin, laminated foamcore panels with velcro or rivets. These panels can be replaced very quickly if your message changes frequently. While dimensions may vary, frequently the rear panels are 20 inches tall by 30 inches wide, and the sides are 10 inches tall by 19 inches wide. Click to see.